What are the matches and players to watch during Saturday’s 16-game slate? After Orange County SC and ATL UTD 2 kicked off Week 6 with victories on Wednesday night, USL Championship action returns this weekend with a jam-packed slate of 16 games. All the action will take place on Saturday with Ottawa Fury FC getting things underway early in the afternoon when it hosts Loudoun United FC at TD Place (2 p.m. ET | Match Center | ESPN+). The day will wrap up late on the West Coast when Fresno FC entertains Tulsa Roughnecks FC in a battle of surprise starters at Chukchansi Park (10:30 p.m. ET | Match Center | ESPN+) and Las Vegas Lights FC plays host to Tacoma Defiance at Cashman Field (10:30 p.m. ET | Match Center | ESPN+). Nashville SC produced its best performance of the season last weekend in Ottawa as Daniel Rios scored a brace to lead the side to a convincing 3-0 victory over Fury FC at TD Place. After previously watching his side score just three times over its opening three games, Head Coach Gary Smith will be hoping the offense continues when Nashville welcomes in-state rival Memphis 901 FC to First Tennessee Park. Expansion 901 FC has endured an up-and-down start to its inaugural campaign and will make the drive east on I-40 after suffering a Wednesday-night loss to ATL UTD 2 where Memphis was unable to break down the visiting defense. There’s been plenty of build-up to the first Tennessee derby on social media between both the clubs and their fans, but who will walk away with bragging rights? 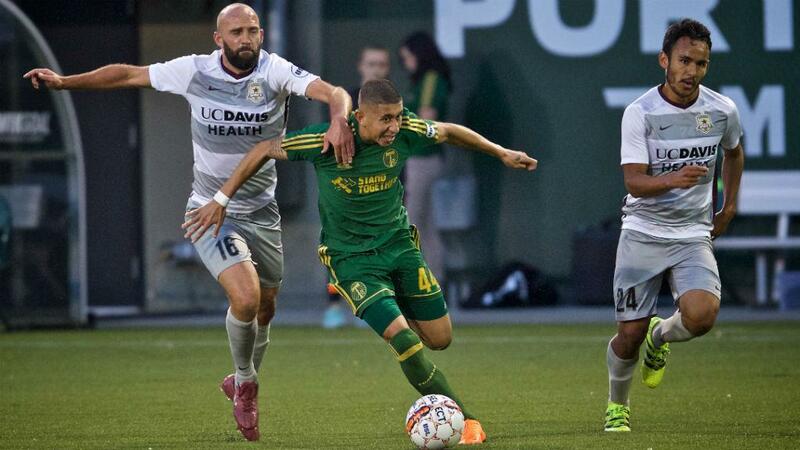 Level atop the Western Conference on 10 points after five games played, the Portland Timbers 2 and Sacramento Republic FC will look to put some distance between themselves and the rest of the field with a win at Merlo Field. Interestingly, the two sides don’t just share an identical record, but they also have achieved the exact same form (DWWLW) and goal differential (+4). Something surely will have to give on Saturday night, right? New Mexico United also enters the weekend level atop the West with 10 points after setting the Championship record for the longest unbeaten start to the season for an expansion side (six games) in Saturday’s scoreless draw at Rio Grande Valley FC. Head Coach Troy Lesesne’s side will return home to Isotopes Park with the hope of keeping that run going against a confident Real Monarchs SLC side that avenged its 2018 USL Cup Playoffs defeat to Reno 1868 FC with a 3-1 victory last time out. To get a similar result on Saturday, the Monarchs will need to get over their road woes that saw them lose at Las Vegas Lights FC two weeks ago and suffer 10 defeats away from Zions Bank Stadium a year ago. 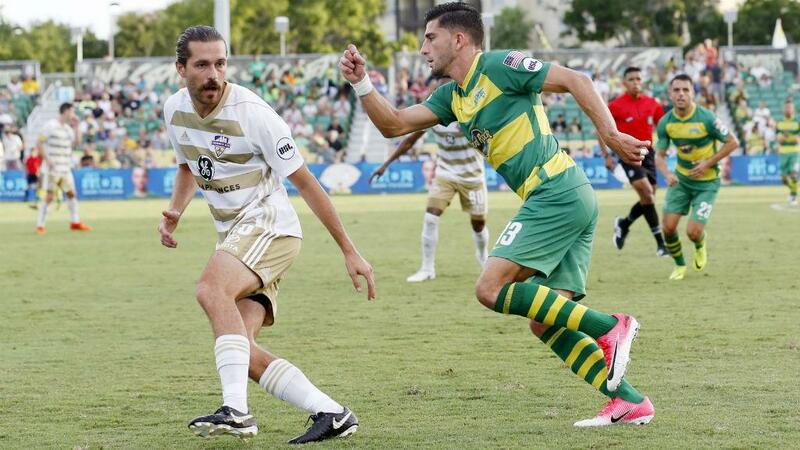 Two Eastern Conference sides heading in opposite directions clash on Saturday when the Tampa Bay Rowdies host Louisville City FC at Al Lang Stadium. The Rowdies are coming off a 4-0 romp against Hartford Athletic and will look to continue their unbeaten start to the 2019 campaign against the two-time defending USL Cup champion. Louisville, meanwhile, will look to kickstart its title defense after suffering back-to-back home losses for the first time in club history. That won’t be an easy task for Head Coach John Hackworth on his homecoming as his squad added George Davis IV and Luke Spencer to its injury list last weekend and will face a Rowdies’ defense that has yet to concede a goal on its home turf this season. The 6-foot-2 center back has played every minute of the season so far for table-topping Saint Louis and leads the club in clearances (29) and aerial duels won (17 of 24). Fink has also contributed on the offensive end, scoring the opening goal from the penalty spot in last Saturday’s 2-0 win over ATL UTD 2 and twice overall in five games. The 25-year-old, who serves as the club’s captain, will look to continue to lead by example when STLFC tries to keep its unbeaten start going against Birmingham Legion FC. Guzman scored what proved to be the game-winning goal for San Antonio last weekend as the club claimed its first victory of the year against Las Vegas Lights FC at Toyota Field. That strike gave the club’s all-time leading scorer two goals on the season and 18 in 43 career appearances (including postseason). With SAFC now in the win column for 2019, Guzman and his teammates will be looking for more when they host the LA Galaxy II on Saturday night. After leading Pittsburgh with 15 goals and eight assists in 2018, Brett finally broke his duck to score the game-winner from the penalty spot in last weekend’s 1-0 victory at Louisville City FC. With the offseason arrivals of forwards Steeven Dos Santos and Christian Volesky giving Hounds Head Coach Bob Lilley a variety of attacking options, Brett has played the full 90 minutes just once in the team’s opening four games. If the Jamaican can keep making the most of his opportunities, starting on Saturday in the team’s home opener against Hartford Athletic, then he should be in a good place for another strong season. Bakero only joined Rising FC on March 20 but hasn’t wasted any time in making an impact on his new team. The 22-year-old Spaniard, who is on loan from Major League Soccer’s Toronto FC, leads the Western Conference with 15 chances created despite having played just two games for the club. While only one of those key passes has turned into an assist, it seems likely that more will come for the 2017 MAC Hermann Trophy winner sooner rather than later. Don’t be surprised if Bakero helps Phoenix end its streak of four straight draws when it visits Southwest University Park to take on El Paso Locomotive FC on Saturday night. - The Charlotte Independence will look for their first victory of 2019 against the New York Red Bulls II on Saturday at Sportsplex at Matthews. Charlotte earned a 1-1 draw in this fixture last season, but leads the all-time series with New York with a record of 3-2-2. - Pittsburgh Riverhounds SC is 1-3-2 in its previous six home openers at Highmark Stadium, but Head Coach Bob Lilley's side will look to turn that trend around against Hartford Athletic. - "We have to bounce back. You learn your lessons every time you play a game and then you step on the field the next day and you figure out how to fix it. I’m sure we are going to work on our finishing and we are going to Nashville with the intent to win.” – Memphis 901 FC defender Marc Burch. After Saint Louis FC suffered its first loss of 2019, who takes the top spot? ©2019 Colorado Springs Switchbacks FC / SportsEngine. All Rights Reserved.